Frederick the Great is an awkward figure for German patriots in certain respects. Politically, he was in no ways a German nationalist, defining “German liberty” as maintaining the independence power of the Holy Roman Empire’s little principalities, in effect the political division of the German nation. On a personal level, he thought the German language was ugly and preferred to speak French. This does not mean that Frederick was indifferent to the German nation, however. The Prussian king was keenly aware of German cultural identity, appealed to German national pride, and argued the benefits of a specifically German-language literature and culture. This is made clear in a long letter, in fact a detailed educational program, entitled On German Literature, on the Flaws for Which It Can Be Criticized, on Their Causes, and the Means by Which They Can Be Corrected. In the letter, Frederick is a harsh critic of the still non-standardized German language of his day and of Germany’s alleged lack of great authors. At the same time, he urges the Germans to improve their language, to write in German so as to be understood by the common people of Germany, and to achieve literary greatness comparable to the Italians, French, and English. Frederick clearly understands Germany as a really existing national, linguistic, and cultural unit, despite its centuries of political division. All this sits rather awkwardly with the Marxist claim that national identity is a recent construct opportunistically created by nineteenth-century capitalist regimes. I love our common fatherland as much you love it, and for this reason I am careful not to praise it before it has deserved such praise. [. . .] Let us be sincere, and confess in good faith that up to now fine letters have not prospered on our soil. The manly activity of our compatriots did not therefore limit itself to redressing the losses caused by past calamities; it was able to aspire higher, it was able to perfect what our ancestors could only just begin. Since these advantageous changes [reconstruction and development] have taken effect, we see that affluence is becoming more widespread, the third estate no longer languishes in a shameful degradation; fathers are providing for the education of their children without getting into debt. Here are established the signs of the happy revolution which we are waiting for; the fetters which were binding the genius of our forefathers have been shattered and destroyed; already we see that the seed of a noble emulation is sprouting in the minds. We are ashamed that in certain areas we are unable to equal our neighbors; we wish to regain by tireless works the time which our disasters have made us lose; and, in general, the national taste is so decided for all that can win renown for our fatherland, that it is almost obvious that in such conditions the Muses will introduce us in turn to the temple of Glory. Let us then examine what remains to done to tear from our fields the brambles of barbarism which are still present, and to accelerate these so desirable improvements to which our compatriots aspire. Note that throughout On German Literature, Frederick’s appeals to national pride and achievement refer entirely to Germany. His state of Prussia is never even mentioned. What was most unfortunate was that the pedantic vanity of these gentlemen aspired to the applause of all of Europe: in part to show off their fine Latinity, in part to be admired by foreign pedants, they wrote only in Latin; thus their works were lost on nearly all of Germany. From this resulted two disadvantages: first, that the German language, not being cultivated, remained loaded with old rust; and secondly, that the mass of the nation, not knowing Latin, not being able to educate itself, being unable to understand a dead language, continued to wallow in the most boorish ignorance. . . . If our knowledge is treasure, we must not bury it, but make the most of, by spreading it widely in a language understood by all our fellow citizens. It is only recently that men of letters have been bold enough to write in their mother tongue and that they are no longer embarrassed of being Germans. You know that it has not been long since the first German language dictionary was published; I blush at the thought that such a useful work has not preceded me by a century. However we begin to see that a change of mentalities is brewing: national glory is making its voice heard, and people have the ambition of rising to the level of their neighbors . . . Let us then translate ancient and modern classic works into our language. If we want currency to circulate among us, let us spread it among the public, by making common the sciences which were once rare. [T]his language has become a passe-partout giving you access to all houses and all cities. Travel from Lisbon to Saint Petersburg, and from Stockholm to Naples, if you speak French you will be understood everywhere. By this single idiom, you will spare yourself so many languages which you would need to know, which would overload your memory with words instead of which you could fill with things, which is much more preferable. In summary, Frederick’s educational and cultural program, far from ignoring or rejecting German national identity, embraces it on several levels. Germany, not Prussia or Europe, is conceived as the cultural-linguistic unit to be improved. German national pride is to be appealed to in order to motivate the Germans to equal their neighbors. This does not mean lack of self-criticism, on the contrary, the German nation’s development, language, and letters must be judged in a spirit of fair criticism, in order to make improvement possible. Nor does it mean a sort of closed-off chauvinism, for Frederick endorses taking the best of foreign cultures and the learning of a lingua franca to better communicate with them. Literature in the national language should be promoted, however, so that all citizens can become as cultivated as possible. 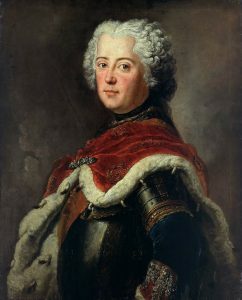 Hence, already in Frederick the Great, that “enlightened despot” so hostile to German political unity, we find an endorsement of popular and national education, which would prove so important for the awakening of German national consciousness and the entry of the German masses into world history. Published: October 11, 2017 | This entry was posted in North American New Right and tagged articles, education, Frederick the Great, French, Germany, Guillaume Durocher, language, literature, nationalism, North American New Right, originals. Both comments and trackbacks are currently closed. Who knew that he had so much in common with Merkel! Do you have the context of that quote? I would think it is an anti-clerical remark. I am not sure how strong Frederick’s racial consciousness was (his friend Voltaire was certainly very aware of racial differences). By way of comparison, Frederick had a rather ambivalent Jewish policy, clearly seeing Jews as a problem population whose numbers had to be limited, but nonetheless using small numbers of them to fulfill particular economic roles.